With the 64B LED Pro Par Can light fixture from ADJ you can create the perfect atmosphere to have your clientele coming back night after night. Ample and well controlled lighting is key to an easily enjoyed performance; the 64B LED Pro par can excels at providing you with powerful light effects and built-in features that allow for the greatest ease of operation. Made from high quality materials and using 50,000 hour rated LEDs the 64B LED Pro is built to last and go with you everywhere you need it to. 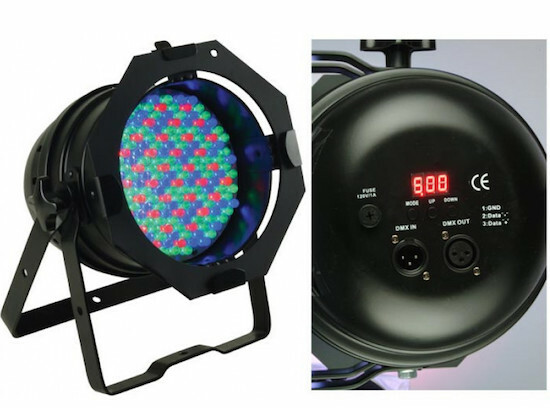 Now you can create the permanent professional setup of your dreams, or the professional mobile production of a lifetime with the effective lighting services of the 64B LED Pro Black Par Can Lighting Fixture from American DJ, an affordable, portable and lasting investment.